The main plaza in Latacunga, Ecuador. “Snow on the Equator?” I thought scratching my head. Wow, ok, there it is. Referring to the massive, snow-capped mountain that resembled the Matterhorn that stood before me. A true “Matterhorn” in Ecuador. But this one is named “Cotopaxi”. At 19,300 ft it’s one of the tallest active volcanos on earth. And you can climb it without needing to be an expert (with a guide). Or bike down it in groups that leave from Quito daily which drive you up to the snow line and then lead you on an all day bike descent as you pass from one micro-eco-system to another. A few brave souls even ski it. 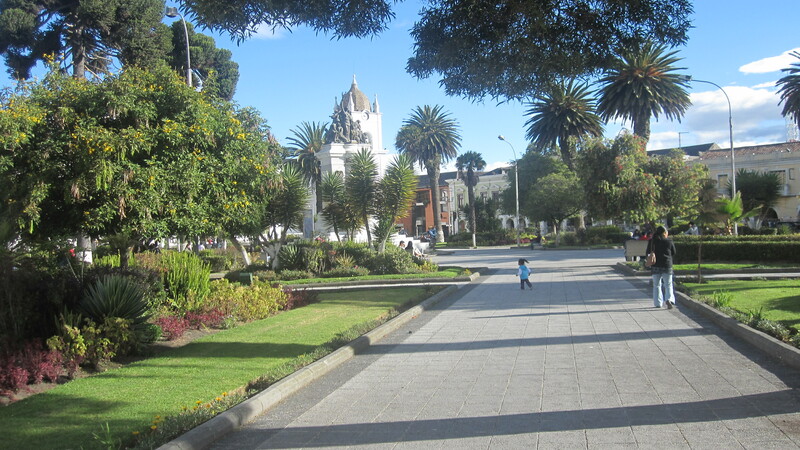 And it’s near a town a few hours south of Quito called Latacunga, where I’m writing from this week. Latacunga is a small town nestled deep in the Andes Mountains with an old colonial center and surrounded by lush, green farms. It’s truly a hidden gem ideal for you if you’re looking for a small, cooler mountain town in which to have a small farm or maybe restore an old colonial. It’s gotten no international press like other, similar places in Ecuador like relatively nearby Cotacachi, Otavalo or Vilcabamba and currently there are very few permanent foreign residents. Prices are still cheap with country town homes on the outskirts starting around $30k. Nearby Broccoli and Strawberry farms start around $8-15k a hectare (1 hectare = 2.5 acres). And I couldn’t help notice, myself being in the hospitality industry, that the few hotels in town are full. But who can be surprised with one of the top draws in Ecuador nearby, Cotopaxi, as well as Quillotoa, a volcano with a turquoise-colored lake in the crater you can hike down to without even needing a guide. And the also nearby, locally-famous Andean Market of Saquisili. Which is a more authentic version of the Otavalo indigenous market hundreds of tourists are shuttled to daily. I’d stay in Villa de Tacunga, a boutique hotel in the old-colonial style with an excellent restaurant (try the Trout for $5!) Singles start around $45, and doubles $60. For smaller budgets I’d try the Hostel Tiana, also in the city center with singles starting around $15, and doubles $25. If you don’t eat in the restaurant in the Hotel Villa de Tacunga, try the one in the nearby Hotel Rodelu, the Filet Mignon ($10) is a good choice. Even if colder climates aren’t where you’re looking to live as an expat, Latacunga and this area of Ecuador is a must-see on any trip itinerary to this country!